When I have often talked about how really good food must taste, like the flavour from the land it comes from, going to see Slow Food Story at the Victoria Film Festival ’14 was a must. I did not know much about what this movie is. Other than the hints from the plot summary in the guide, I purposely did not want to know more than I should before sitting at the balcony. What I watched was part documentary and part TedX presentation. It felt like I was back in college, sitting in at a Art History class. 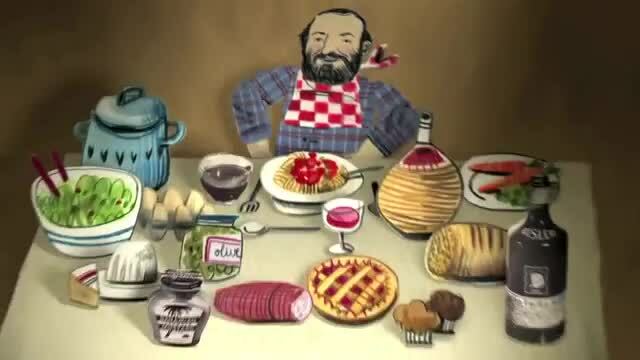 This movie looks more at the life and times of Carlin Petrini, the founder of the Slow Food Movement, than be a celebration of food. The latter is there, in the form of moving pictures of the food expos and parties that can happen, but there needs to be more to this film than to get political. The opening segment is a necessity to show audiences who Petrini is and what he is all about. However, this act was very drawn out. The little animated sequences were a very nice touch and that kept me interested in this show. But until the food clips were brought out, I thought this film spent too much time studying the origins of a group of spirited people who wanted to invoke change for the betterment of humanity. Will I join? I don’t know. There’s something that I like about being a punk rock food junkie — I like to live by my own rules than to follow any manifestos. When that book was presented, I was hoping for more than glimpses. The arts and craft style deco contained in Il Manifesto had me exploring the layout more than the text. The artist in me was awakening, and part of me wanted to go Salvador Dali on the text. More than half the film is about the rise of this movement in Italy and how it has grown. I particularly liked the narrative about how the founders have grown close and apart. When one of them passed on, that was more enduring to watch than the slow burn happening that was trying to define what the movement is about. Without a human element, a documentary is never 100% perfect. Slow Food Story is enjoyable because it expounds upon forging community spirit and supporting many local causes. When considering that this movement has a worldwide network of 170 chapters in 150 countries, that’s amazing. As for the political subtext that’s inserted into this documentary, I was tuning that out fast. This film cannot operate without it, but I have to note that not everyone particularly enjoys wanting to know how rhetoric works in this particular arena. All I have are images of people carrying swords and guns, and if one party disagrees with another, all hell can break loose. This documentary will always be around to spread the message. The movement started when McDonald’s decided to open a shop in Rome, next to the Spanish Steps. That was enough to cause Petrini to sally forth and rally the masses. This fast food conglomerate is easy to pick on, and its a place I will not go to. Well, maybe for a soda when I’m in the mood or to use their free WiFi, but never to eat. But until everyone joins in to promote sustainability and mandate accountability, the people that need to be influenced to change for the better will be the business people who runs these mega-corporations, businesses and restaurants. But in this case, just how far this movement will affect the masses, that is the common folk, depend on how far this film’s message hits home to the viewers. For now, the phrase Viva La Revolution is a light cry that is being very gently heard. This entry was posted in Film, Reviews and tagged The Vic Theatre, Victoria Film Festival. Bookmark the permalink.